So, what the heck is going on? The reality is that overall retail spending continues to grow steadily if a little meagerly. But several trends—including the rise of e-commerce, the over-supply of malls, and the surprising effects of a restaurant renaissance—have conspired to change the face of American shopping. The simplest explanation for the demise of brick-and-mortar shops is that Amazon is eating retail. Between 2010 and last year, Amazon’s sales in North America quintupled from $16 billion to $80 billion. Sears’ revenue last year was about $22 billion so you could say Amazon has grown by three Sears in six years. Even more remarkable, according to several reports, half of all U.S. households are now Amazon Prime subscribers. There will always be a place for stores. People like surveying glitzy showrooms and running their fingers over soft fabrics. But the rise of e-commerce not only moves individual sales online but also builds new shopping habits, so that consumers gradually see the living room couch as a good-enough replacement for their local mall. There are about 1,200 malls in America today. In a decade, there might be about 900. 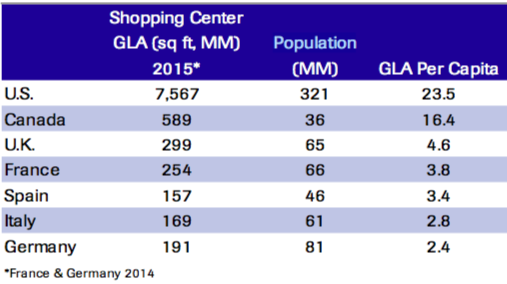 That’s not quite the “the death of malls.” But it is a decline, and it is inevitable. The number of malls in the U.S. grew more than twice as fast as the population between 1970 and 2015, according to Cowen Research. By one measure of consumerist plentitude—shopping center “gross leasable area”—the U.S. has 40 percent more shopping space per capita than Canada, five times more the U.K., and 10 times more than Germany. So it’s no surprise that the Great Recession provided such a devastating blow: Mall visits declined 50 percent between 2010 and 2013, according to the real-estate research firm Cushman and Wakefield, and they’ve kept falling every year since. In a long and detailed paper this week on the demise of stores, Cowen Research analysts offered several reasons for the “structural decay” of malls following the Great Recession. First, they said that stagnating wages and rising health-care costs squeezed consumer spending on fun stuff, like clothes. Second, the recession permanently hurt logo-driven brands, like Hollister and Abercrombie, that thrived during the 1990s and 2000s, when coolness in high-school hallways was defined by the size of the logo emblazoned on a polo shirt. Third, as consumers became bargain-hunters, discounters, fast-fashion outlets, and club stores took market share from department stores, like Macy’s and Sears. Once autonomous vehicles are cheap, safe, and plentiful, retail and logistics companies could buy up millions, seeing that cars can be stores and streets are the ultimate real estate. In fact, self-driving cars could make shopping space nearly obsolete in some areas. CVS could have hundreds of self-driving minivans stocked with merchandise roving the suburbs all day and night, ready to be summoned to somebody’s home by smartphone. A new luxury-watch brand in 2025 might not spring for an Upper East Side storefront, but maybe its autonomous showroom vehicle could circle the neighborhood, waiting to be summoned to the doorstep of a tiny apartment building. Autonomous retail will create new conveniences and traffic headaches, require new regulations, and inspire new business strategies that could take even more businesses out of the commercial real estate. The future of retail could be even weirder yet.